Change — something that many fear but something that many times brings forth new opportunity and advancement. Weld Wire Company Inc. has been providing costumers with quality welding supplies for over 65 years. The secret? CHANGE. The company has morphed and expanded over the years in order to continue its’ success and progress. Alan and Jeff Saul, part owners of Weld Wire, expressed their love for the company and excitement for its future with the changes put forth. As Jeff explained it, “the company has naturally moved toward change with the new taking over for the old.” That being said, the company has undergone a large transformation. Brent Saul, part owner of Weld Wire, has made it his mission to move the company’s progress forward. While the goal of the company has always been to create a positive atmosphere and a comfortable place to work, Brent wanted to take it a step farther and create a family environment for everyone in the company. It seems that Brent truly succeeded in this pursuit as each and every member of the Weld Wire family acknowledged that Weld Wire is their home away from home and extended family. Both Joanna and Melissa A, employees of the company, explained that with the love and support of the team at Weld Wire, they have been given incredible opportunity and have been changed in many ways. All of the employees also stressed that the company has become team oriented rather than competition oriented. Melissa Y, an employee of Weld Wire for 13 years, expressed the team feel and said that “the employees have changed a lot and the group that we have now works together impeccably. We work together like a team and family.” Happy employees bring outstanding performance, therefore, the members of the family at Weld Wire come to work each and every day ready to achieve. Jessica, a newer addition to the team, emphasized that she wakes up in mornings ready to work as hard as possible because she is not just doing a job at Weld Wire but is working for her team and is, in turn, helping herself as well as her co-workers succeed. Additionally, the transformation of Weld Wire included remodeling of the office building. New floors, conference tables, bathrooms, and more have improved the atmosphere of Weld Wire and suits the company’s professionalism. Sue and Michelle, mother and daughter and long time employees of the company, expressed that the new and improved appearance of the office has created a much better working environment. What is truly unbelievable is that, overall, each and every member of the “family” seemed to say the same thing — Weld Wire works as a team and family in order to strive to be the best company possible. Hearing the same words over and over again from multiple different people exemplifies the honorable, loving nature of Weld Wire. As John, another employee, expressed “at Weld Wire we are all family and are all vested into each other’s success.” How amazing to have a company in which every employee enjoys going to work each day. 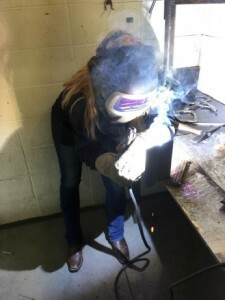 When I was asked to sit down and write a blog for the Weld Wire Co. Inc website that discussed the importance of welding in the world and in the lives of myself and the other employees at Weld Wire, I truly had no idea what I was going to say. Being a Saul, of course, I have always been aware of the steel industry and the major role it has played in my family’s life. To me, the steel industry was important in a financial aspect for my family, however, I had never understood how welding affects my daily life and the daily lives of others. This question sparked an interest in me and I began to research to understand the purpose of our company, Weld Wire, and why selling welding material is so important to the world. I am always looking to find a purpose when performing a task or job. In doing so, it always gives me the push to strive for the best. As my father, Brent Saul, always says, “You need to be the best at what you do, no matter what it is you are doing.” In order to live by his words, I needed to find the purpose behind selling steel and what welding does to benefit the lives of myself and others. I believe I have found my answer. The best part of what I have found is that there are so many answers to this question. As you will read, many of the employees here at Weld Wire find a different reason for the importance of welding in their own personal lives. What is welding, you may ask. In simple terms, welding is a process that joins two metals together permanently (welding information center). Welding is a part of our everyday lives. From the kitchen appliances we use each day, the buildings we live in, to the cars we drive. Most of what we use is welded or made with equipment that has been welded (welding information center). Without welding, our lives would be completely different and frankly, quit boring. Getting to another country would be impossible seeing as airplanes, large ships and other means of transportation would be nonexistent. Imagine a world where we could not just hop in the car and run to the grocery store for the missing ingredient in a recipe. What about a world in which some of the most well-known sculptures and works of art weren’t around? Without welding, works of art such as the Arch in St. Louis would not have been created (welding information center). Sites such as the arch are major aspects of the world and are what make each country unique. Ultimately, it has become clear to me that the world truly would not be the same without welding, yet, most people do not even give it a thought. When looking at the steel business in this light, my whole perspective has changed. I now understand why it has been so important to my family and that the work done at Weld Wire and within the steel industry as a whole is immensely important. Welding is a part of our everyday lives. First Weld Wire “Spark” Award Winner! 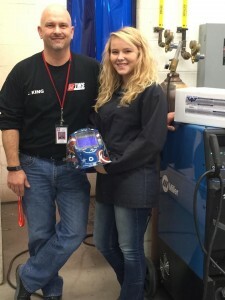 Congratulations to Chrissy Heizer, 17, Winner of the First Weld Wire “Spark” Award! In one way or another, I’ve been a coach my entire adult life. My early passion for playing sports put me in contact with coaches who helped make me the person I am today. They pushed me, challenged me, taught me, and most of all – they believed in me. That’s something I try to pay forward every day. In coaching my kids’ sports teams, I’ve seen firsthand what the right kind of encouragement can do for a young person. It can truly change everything. At Weld Wire, we’re dedicated to finding and fueling those sparks in the welding field. That’s why we’ve started giving “Spark” Awards to young people just entering the industry who have the potential and dedication to make a great career in welding. 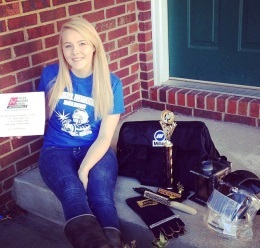 In November, we sponsored The 2014 Central Kentucky Welding Classic, a welding contest where some of the best student welders in the state compete for scholarships and other prizes. The contest, nearly a decade old, is hosted by Chris King, an instructor at the Hughes Jones Harrodsburg Area Technology Center and this year attracted students from 17 different schools. Weld Wire donated Duramax electrodes and MIG wire to the competitors, along with a prize of a $200 scholarship towards welding school costs. 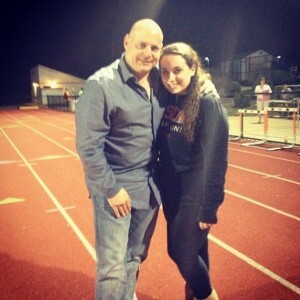 Chrissy is a remarkable young woman, and we are thrilled to be able to support and coach her as she pursues her dreams. From me and the entire Weld Wire family: congratulations, Chrissy! We can’t wait to see what you’ll achieve next! I sell filler metals for welding; yet I have never welded in my life, nor have I actually watched a welder performing the art in person. The closest I had ever been to welding was watching Jennifer Beals on the big screen circa 1983 in Flashdance. Therefore, I was beyond excited to finally have an opportunity to experience, first hand, a team of welders running the material that I delivered personally in order for them to qualify our product. All I can say, is “WOW!!!!”. Before arriving, I was not certain if the testing would be done on the day I was delivering, or on another day, when they weren’t so busy. But to my surprise, they were all set up for the process and invited me to stay; I was thrilled. Once the team finished adjusting the settings to ensure performance capability, each welder was given the chance to work with and run the material. When the head welder stepped up to do his thing, I wasn’t quite sure of what to expect; however, in my mind I imagined a bead; a simple bead running down the middle of the block, in a straight line, joining the two metal plates. What a rush when the sparks started flying! After a couple of minutes, when the welder took a step back to gain a different perspective, everybody else seemed to lean in to get a closer look at the weld (and of course, I leaned in to). What I saw, and what was created, completely shocked and amazed me. The result was a shiny perfect metal weave; which in a way reminded me of the braid I make in my daughter’s ponytail each morning. It was gorgeous; a work of art. I was in awe. For so long my mind had focused on the strength of the weld as opposed to the beauty of the weld. Since my experience, I find myself inspecting visible welds wherever I go, and recently asked my colleagues about their “first times”. Yes, welding is super COOL, and I am happy to report that the weld team I referred to that tested my hand-delivered E71T-1C/-1M was ecstatic about our wire! And we here at Weld Wire Company are ecstatic about the future of this critical and awesome Industry! Thank you for reading. Helping those in need and supporting our community is our way of “giving back”. We here at Weld Wire Company feel that we have a responsibility to those in need and to those less fortunate. We hope with all of our hearts to make a difference and do our part to make the world a better place. Weld Wire Company has had the pleasure this year of working with and supporting Cradles To Crayons. Cradles to Crayons is a non-profit organization that provides homeless and low-income children living in the Boston and Philadelphia regions, with the essentials needed for them to feel “safe, warm, and ready to learn.” If you would like to help or learn more about the program, please visit them at www.cradlestocrayons.org. In the spirit of the season, The Weld Wire Company Family wants to wish all of our friends, families, customers and suppliers a very safe and happy holiday season. In addition, we wish you all a healthy, happy and prosperous 2014! Although this is Brent’s Blog and I am very new to the World of Welding, I wanted to share that I am learning so much on a daily basis and finding myself utterly fascinated by this trade…this “art” that I knew nothing of in my previous life. We at Weld Wire Company simply supply a component of what the artist needs, the filler metals; however, there are questions asked of us daily by our customers that lead us to believe that we could possibly provide even more. Some of these questions have left us scratching our heads wondering why so many of our customers are having difficulty finding dependable, qualified welders. Although some have shared that they can indeed find a welder; but that they cannot keep a welder, or the welder that they do find, does not share the same work ethic as the “old-timers”. Welding is such an essential trade and so integral to the growth and management of our world and our infrastructure; the bridges we desperately need built and repaired…the strong pipelines to transport oil and gas, the tools that make our lives and occupations safer and easier. The question arises, why isn’t the younger generation encouraged and exposed to welding? Why are they not looking into this trade earlier, this trade that’s so intrinsic to society? One could ask themselves if it may be society’s pressure. We are programmed that if we are going to be “successful” we must go directly to a four-year college, or university, and this is the road that must be travelled, if we are to achieve this “success”. In many cases, society measures this success by how much money we make, and we do indeed need money to eat, keep a roof over our heads and support our families. On www.indeed.com, pipe welders are sharing their pay rates to be anywhere between $24.00/hour to $110.00/hour while a foreman with a natural gas company in Arizona remarked that, with a recent raise, he will break $110,000 this year. We at Weld Wire Company are going to be exploring these questions, digging deeper into the Welding Arena, and looking into ways that we can do our part in nurturing this extremely necessary trade in the months ahead. If anybody reading this Blog has suggestions as to how we could do more to advocate and encourage this important field, we are always here and open to ideas. In addition, I would like to thank Brent Saul for allowing me to share my thoughts in his Blog space, and I hope to have the chance again in the future. Please stay tuned!